■ GHANA: Slovenian business aviation specialist, Elit'Avia, sets up shop in Accra. Slovenia's Elit’Avia, a fully-integrated provider of business aircraft charter, management and operation services, has announced that it has opened an office in Accra, Ghana and is currently managing four business aircraft for West African clients, specifically: two Bombardier Global 6000s and a Bombardier Global XRS in Nigeria, plus a Dassault Falcon 2000 in Ghana. Management of these aircraft is a blend of both exclusive client use and charter availability. ■ SOUTH AFRICA: Bombardier sets up a Regional Support Office and Parts Depot in Johannesburg. Canadian aircraft manufacturer, Bombardier Aerospace, has opened a new Regional Support Office (RSO) and parts depot in Johannesburg, South Africa. The office and depot will anchor regional support capabilities for Bombardier business and commercial aircraft customers in Africa. Both the Johannesburg RSO and parts depot are co-located at Bombardier’s Business Aircraft Authorized Service Facility (ASF) at ExecuJet South Africa’s facility at Johannesburg's Lanseria Airport. It will be the 11th parts facility in Bombardier’s network. ■ ETHIOPIA: Bombardier appoints Ethiopian Airlines MRO an Authorized Service Facility for commercial aircraft. Bombardier Aerospace has named Ethiopian Airlines (ET) as an Authorized Service Facility (ASF) for commercial aircraft. Bombardier has signed a Letter of Intent to authorize the airline to perform line and heavy maintenance on Q400 and Q400 NextGen turboprop aircraft. The agreement is expected to take effect by late August. ■ CANADA: Bombardier sees strong African market potential for its CSeries twinjets. Canadian aircraft manufacturer, Bombardier, foresees strong growth potential for its nascent CSeries Regional Jet on the African market despite no continental carriers showing any interest in the type as yet. ► COTE D'IVOIRE: Air Cote d'Ivoire to acquire two Q400s as Aga Khan Fund moves to divest. Aérienne de Participation-Côte d'Ivoire, the holding company for the Aga Khan Fund for Economic Development (AKFED), has announced that it is to sell off its 15% shareholding in Ivorian carrier, Air Cote d’Ivoire (HF). The move comes as Air Cote d’Ivoire is planning to boost its capital base from USD4.92million (XAF2.5billion) to USD49.2million (XAF25billion) effective today, Wednesday June 5. ■ NIGERIA: Akwa Ibom State approaches Bombardier, Lufthansa Technik over possibility of MRO facility, new regional airline. The local government of Nigeria's Akwa Ibom State has approached various international firms among them Canadian aircraft manufacturer, Bombardier Aerospace and Lufthansa Technik, over the possibility of them partnering the government in its project to build and operate an MRO Hangar facility at Uyo's new Ibom International Airport, currently under construction. A new regional carrier, Ibom Airlines, is also planned. ■ CANADA: Nigerian ExIm Bank, Export Development Canada discussing possible short term financing for Nigerian aviation sector. The Nigerian Export Import Bank, NEXIM, and Export Development Canada (EDC), Canada's export credit agency, are exploring the prospects of a partnership to provide short term financing to Nigeria's aviation sector. The following is a fleet update bulletin for aircraft that are in use, have been in use or will be in use for these listed airlines: AV Cargo Airlines, Jet 4 Now (Allegiance Airways Gabon (ATG)), The Republic of the Gambia, and Air Uganda(U7). ■ SOUTH AFRICA: ExecuJet extends Cape Town MRO capabilities to include Q300 support. ExecuJet Africa, part of the ExecuJet Aviation Group, is expanding the support capabilities at its Cape Town International Airport facility to cover the Bombardier Dash 8-Q300 aircraft, due to growing demand in the region. ► RWANDA: RwandAir signs up for one dual-class Bombardier Q400NG. Fresh from their latest fleet upgrade, Rwandan national carrier, RwandAir (WB), has announced the signing of a firm purchase agreement with Canada's Bombardier Aerospace for one Q400 NextGen turboprop airliner. 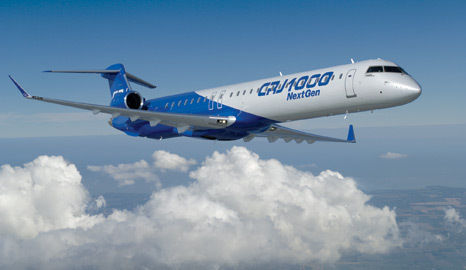 The Q400 will be used to replace the airline's current older Dash8-200 used to ply domestic and close regional routes. ► KENYA: Blue Bird Aviation set to take on two further Bombardier Q400s for cargo ops. Kenyan cargo carrier Blue Bird Aviation (BBZ) is due to take delivery of two former Augsburg Airways (IQ) Bombardier Q400s to add to its growing fleet of 11 aircraft.